The transportation committee of Brooklyn Community Board 16 last night voted in favor of a plan to stripe Brownsville’s first bike lanes, reports Nupur Chaudhury of the local non-profit Brownsville Partnership. 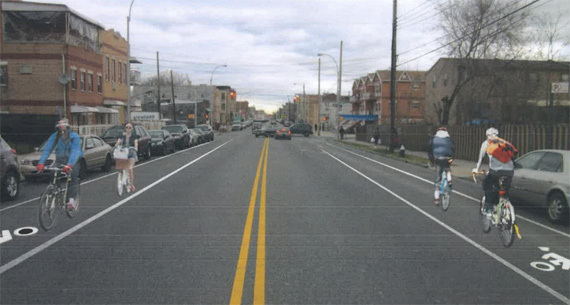 The plan presented by NYC DOT would stripe four bike routes in Brownsville and East New York: on New Lots Avenue, Pitkin Avenue, Mother Gaston Boulevard, and the north/south pair of Hendrix Street and Schenck Avenue. The New Lots and Hendrix/Schenck routes were originally slated for a future round of striping, but DOT was able to bump up the installation schedule to 2013, according to Chaudhury. “It means there’s two east/west routes and a north/south route in both East New York and Brownsville,” she said. These bike lanes aren’t top-of-the-line infrastructure — they’ll provide stripes and, in some places, just sharrows, not physical protection — but they’re a milestone for two eastern Brooklyn neighborhoods that currently lack any on-street bike routes to speak of. The sight of bike infrastructure is still new enough here that when DOT began putting in the area’s first bike racks (they’ve installed 200 in the CB 16 district since the summer of 2011), Chaudhury heard some residents express confusion about what they were for. With the beginnings of a neighborhood bicycle network in place, getting around Brownsville and East New York by bike won’t seem so unusual. The Brownsville Partnership is one of several neighborhood organizations, along with the Cypress Hills Local Development Corporation and the Pitkin Avenue BID, that have joined with DOT and the Department of Health to make local streets more bike-friendly. The community workshops and events they put on starting in 2011 led to this point and will provide the basis for more improvements to come. Next up: The proposal goes before CB 16’s full board meeting on January 22. DOT will also be going back to CB 5 with the current plan, which includes more routes than the version approved by the board’s transportation committee last fall. Chaudhury says installation this spring and summer is looking likely. These would be a great compliment to the plaza park DOT installed in late 2012 on Legion Street! Poor neighborhoods like this one receive a large transfer of money from the rest of the city. Compared with other measures currently used to help them, I wonder how well providing the poorest residents not only with bike routes but also with simple one-speed bicycles and training in maintainence would fare? My guess is quite well. Compared with the low cost, the increase in health and mobility could be large. And it could start in the housing projects, which the city runs and has excess space in parking lots for bike parking. Rather than fight with screaming NIMBYs on Staten Island and whatever place Eric Ulrich represents, the city should focus its efforts and resources in places like these. @f9b2cb395abd5a101456b3b0a40912e1:disqus I’m not sure establishing a “bike = poverty” link is really the best idea… nor is establishing NIMBYism as a viable strategy by running away at the first sign of a foaming NIMBY. Screaming NIMBYs should be fought; it’s not fun, it’s not cheap, it’s not clean, but it is necessary. Congrats to all involved with this effort. It is tremendous for East New York and Brownsville. Now think of how many other poor and/or majority minority neighborhoods in the city are sorely lacking in bike infrastructure and can use a similar boost – Canarsie, Bed-Stuy, Crown Heights, Flatbush, are some that come to mind in Brooklyn. I’m also really glad to see DOH working along with DOT to work towards providing active transportation options for folks in these areas. I think healthy, safe streets for all people is a winning message that people can understand, rich or poor. Just a thought, but maybe the perfect is the enemy of the good in some cases? I understand that protected bike lanes are super popular with Streetsblog right now, but I can’t help but wonder how expensive they are. I’d rather see anything resembling cycling infrastructure than a local DOT saying “heck no, we’re not going to pay THAT much,” especially for places outside of NYC that really don’t need such infrastructure. Beats bike = gentrifyer. Don’t know how cyclists got stuck with that one. I’d like to make sure that all the less well off, particularly the young, have an opportunity to ride. As for running away, the more of the city where people using bikes becomes common, the more the remaining areas will want them. It’s an easier fight when most of those fighting are locals. @f9b2cb395abd5a101456b3b0a40912e1:disqus I dunno, but I do think the best position is to ignore all this stupidity, and just target everyplace… The DOT shouldn’t be playing dumb games.